A brownie or chocolate brownie is a flat, baked square or bar, usually containing nuts. Brownie was developed in the United States at the end of the 19th century and popularized in both the U.S. and Canada during the first half of the 20th century. Brownie was first created by a chef at Chicago’s Palmer House Hotel for ladies attending the Chicago 1893 World Fair. The earliest published recipes for a brownie like those of today appeared in the Home Cookery (1904, Laconia, NH), Service Club Cook Book (1904, Chicago, IL), The Boston Globe (April 2, 1905 p. 34), and the 1906 edition of The Boston Cooking School Cook Book by Fannie Merritt Farmer. A variation that is made with brown sugar and no chocolate is called a blondie. After reading this recipe, I think that everyday should be National Brownie Day! 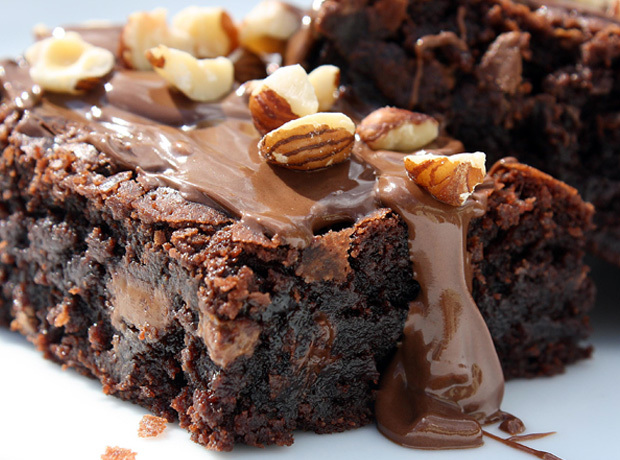 We want this brownie immediately!